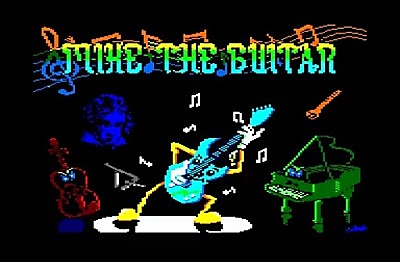 Indie Retro News: Mike the Guitar - Could this ZX Spectrum homebrew be as good on the Amstrad CPC? 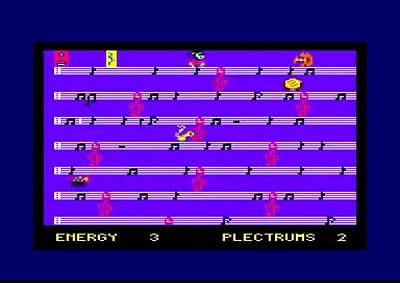 Mike the Guitar - Could this ZX Spectrum homebrew be as good on the Amstrad CPC? Mike the guitar? Well, I guess you'll have to if you want to hear it. Time to get those pedals out - Mike The Guitar is here! If there's one thing better than Mike the Guitar coming out on the Spectrum then it's Mike the Guitar coming out for the Amstrad CPC! Multi format! Yeah! Fresh from the release of MTG on the Spectrum creator Sebastian Braunert has brought everyone's favourite walking guitar (is there another one?) to the home of Alan Sugars' 8 bit behemoth! Created with AGD and with the very talented Andy Green creating the loading screen for this version too, what we have is another great combination and one that worked so well on Speccy original. Let's see what this one has to offer. You take control of Mike as he looks to take on a whole world of nasties on his mission to collect plectrums scattered around each level to move on to the next one. Also, you will find energy power ups along the way to help you get past said nasties, who in this game take the form of other musical instruments. Who knew that guitars and saxophones wouldn't get on? This is one 'mash up' that doesn't work; though that said - do any? But enough talk of pop culture, let's carry on with the game! Mike is quite a nimble little mover as you see him shuffle along each stave, moving his little...well, I would say legs but it's more the curvy top or bottom of the guitar (technical term), that wiggles away as it propels him in the requested direction. Old Mike does bear a striking resemblance to Monty Mole holding a stripy stick or possibly a clanger but maybe that my own nostalgia taking over, or it could just be that Monty Mole looks like a guitar but have never noticed it before; either way, he's kind of cute in a guitary/moley kind of way. Looks like Mike is in trouble, I'm sure he'll get himself out of it - don't fret. You make your way up and down the screen via the many clefs that join each level but be mindful of the many evil instruments that are looking to twang your strings, in a bad way, and take away a life but, if you have quick sharp reactions like me *coughs*, you shouldn't have any issues making your way around the screen. Not only is Mike nicely animated but the enemies also look good, although this is pleasing on the eye, it is also somewhat negative. Whilst you sit back admiring thinking 'that's a lovely looking trumpet' you forget where you are and BAM! That same lovely trumpet has got you. Just because it looks good, doesn't mean it is good, is a valuable lesson here. What else has Mike The Guitar have to offer? 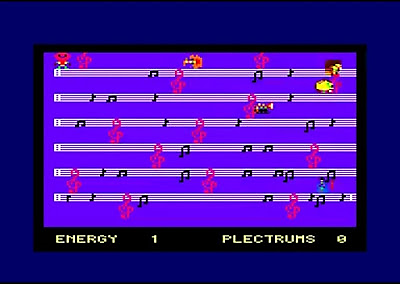 Well, you can expect some beautiful tunes coming out of your CPC as you play along; though not only in the gameplay but on the menu screen too with a cracking rendition of the William Tell Overture that greets you as you fire this one up. The game is FULL of music from the menu, to the credits and all over the game itself and each all beautifully done. You'll have a hard time keeping you feet still whilst playing this one. Mike The Guitar is another one of those games though simple in concept, has enough going on to keep you hooked. Nice looking, enjoyable to play and some damn fine tunes! Time to start playing. Right, anyone got a spare E-string going? A had a bit of a run-in with a rogue trumpet - don't ask.